For more information on the Stürmer and its editor, see my book on Julius Streicher. The source: Fritz Fink, “Das Ende. 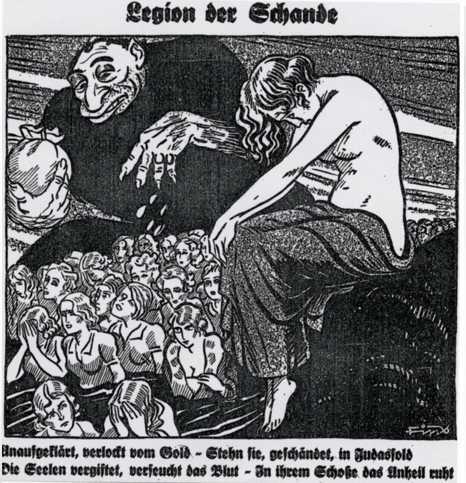 Vom Juden noch im Tode betrogen,” Der Stürmer, #37/1935. An empty car on a lonely path was found in midsummer of this year in Schorfheide, near Werbelliner Lake. The bodies of a man and a woman lay nearby. The doctor who was brought to the scene determined that both had died from poison. They had taken opium and Veronal. The authorities determined the identities of the bodies. They were the 59-year-old Jew Paul Falckenstein and the 25-year-old dancer Anny J. from Cologne. They had traveled from Cologne to Berlin. There they rented a car. They wrote farewell letters in Eberswalde to their acquaintances in Cologne and Berlin. Various newspapers carried big stories about a love drama at Werbelliner Lake. They did not hesitate to give the name of the unhappy German girl, but they intentionally kept quiet the name of the Jew. The Jew Paul Falckenstein had had a relationship with the dancer Anny J. for a long time. His wife knew about it. Certain reporters asserted that the wife of the Jew Falckenstein had refused to allow a divorce. In desperation over the situation, and because marriage to the dancer Anny J. would forever be impossible, Falckenstein decided to take his life. The newspapers that reported in this way know nothing of the Jew and his type. A Jew will not kill himself over a “Goy.” A Jew is not capable of such great and deep love. There was an entirely different reason for the Jewâ€™s suicide. The Jew Paul Falckenstein had things on his conscience that would have landed him in prison within a few weeks. The Jew Falckenstein had once owned the umbrella factory Jakobs & Grimm in Cologne. After the National Socialist revolution, the umbrella factory Jakobs & Grimm transformed itself into a corporation. Typical Jewish chicanery transpired as the stock and ownership was arranged. A while ago the firm ceased paying its bills. The relevant finance office examined the companyâ€™s books. As the officials arrived, the Jew Falckenstein hurriedly left the office. He traveled to Berlin and put an end to his Jewish life at Schorfheide. The Jew Falckenstein did not take poison because of a “Goy.” He was afraid of the law. The Jews thought it a great service that he took a “Goy” along with him. How the Jew Falckenstein must have lied to the girl to persuade her to throw her young life away. Anny J. died thinking that she was the victim of a great love. But she was betrayed to death by the Jew.